This is my 100th post! What better way to celebrate than with a giveaway! Or two or… 8! 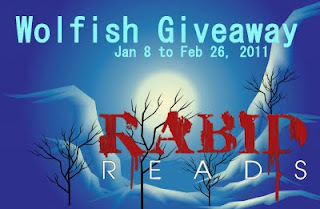 Yes, I will be giving away 8 werewolf new releases between January 8th and February 26th, 2011. A winner will be announced on all of the above mentioned dates and will receive a copy of the book that’s up for grabs that week. In the same post, the next giveaway book will be announced. The winner of the final draw held on February 26th, 2011 will receive all 4 of the books from the previous weeks’ giveaways. Emma Gavin writes about werewolves, but that doesn’t mean she believes in them-not until a pack of real-life New York weres decide to investigate the striking accuracy of her “fiction”. When Aiden Wallace, son and heir of the pack leader, tries to sniff out Emma’s potential informant, he discovers something even more dangerous- an undeniable attraction to her. Winners will be contacted by e-mail by myself and have 48 hours to respond. Each giveaway closes at 11:59AM EST. Winners will be chosen by random.org and this giveaway is open internationally (anywhere the book depository ships). The final giveaway will be based on the cumulative entries from the 5 parts of this giveaway. One form submission per person per giveaway. Giveaway now closed – Winner: Aik Chien! Ohh Hun this is so awesome! lol!! Great idea and congrats on your 100th post! Congrats On your 100th post and what an awesome fun giveaway! Congrats on your 100th post and thanks for the wonderful giveaway! Fantastic! Congrats!! You deserve it. Oh btw I added Giveaway button to my sidebar!! I think that’s +3 right? Thanks! congrats on your 100th post!! and thanks for this awesome giveaway! Very cool contest. Congrats on 100 posts! Great idea!! Thanks for this giveaway & congrats on your 100th post! It’s an awesome giveaway, too! AWESOME! I love werewolf books! Thanks for the awesome giveaway! I can’t wait to see what other great wolfish books you come up with! Thanks! 46 people have entered so far. I’m excited! Awesome giveaway! I want to read this series bad!! Really excited about this wonderful giveaway! What a great way to treat your blog followers! Congrats on your 100th post! Thanks for sharing with all of us. Is there anyway to make the blog button smaller? I wanted to add it tom my blog, but it’s way too big to work. Awesomeness ^.^ Keep up the wolf work! @nytshade13 Try adding width=”120″ to the img src code. Change the size to what works best for you. I saw this book months ago and wanted to read it but couldn’t remember the name. Thanks for posting about it – now I won’t forget! Thanks for the giveaway and this opportunity to enter. Congrats on your 100th post! I’m a new follower and am soooo sorry I missed Part 1 of this giveaway! What an awesome giveaway! I missed it! Ah well. 🙁 contests on your 100th post. Love the blog. 🙂 have been a follower.